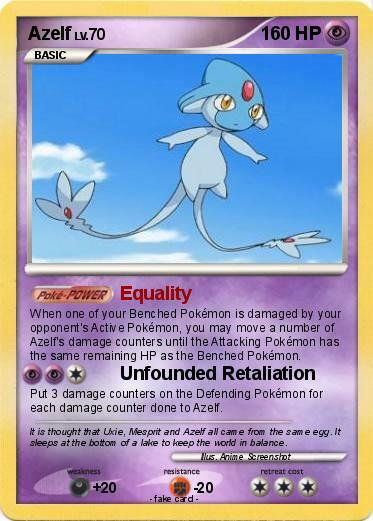 When one of your Benched Pokémon is damaged by your opponent's Active Pokémon, you may move a number of Azelf's damage counters until the Attacking Pokémon has the same remaining HP as the Benched Pokémon. Put 3 damage counters on the Defending Pokémon for each damage counter done to Azelf. Comments : It is thought that Uxie, Mesprit and Azelf all came from the same egg. It sleeps at the bottom of a lake to keep the world in balance.